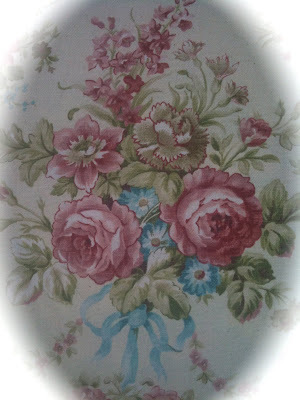 With this shabby french fabric. 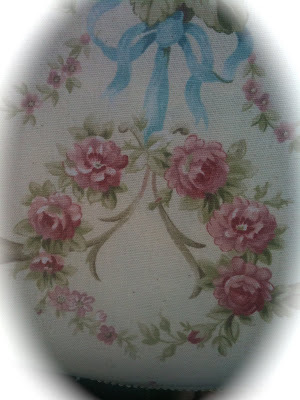 Dainty rose garland swags, gorgeous baby roses wreath & delightful french scrolls. 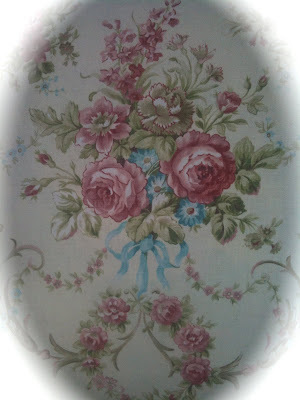 but knew that I loved the pattern and french antique feel. but didn't want to cut it. Crazy, huh? Has anyone ever felt like that? I might have to think twice. I thought I would at least give it a few days to see if all of a sudden 'love' popped out at me. draped it over my chair... and cut it. Loved it immediately and so continued on with the seat. They just weren't working for me. but couldn't find any that I adored that worked with the chair. 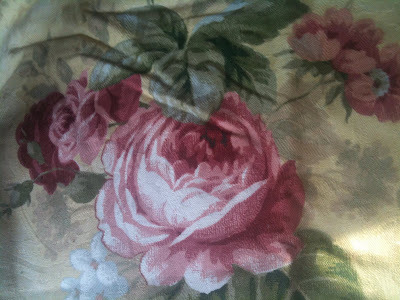 But, I love this fabric for some of those same qualities. 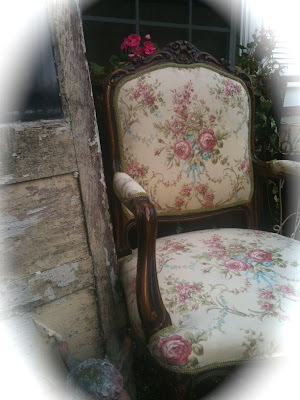 Originally I was planning to paint the chair and go with something really shabby inspired. thanks to the rigamarole we had getting the tacks out! Well I'll say this is shabby perfection! I love how your chair came out. And you were saving the fabric for all the right reasons!! This chair! 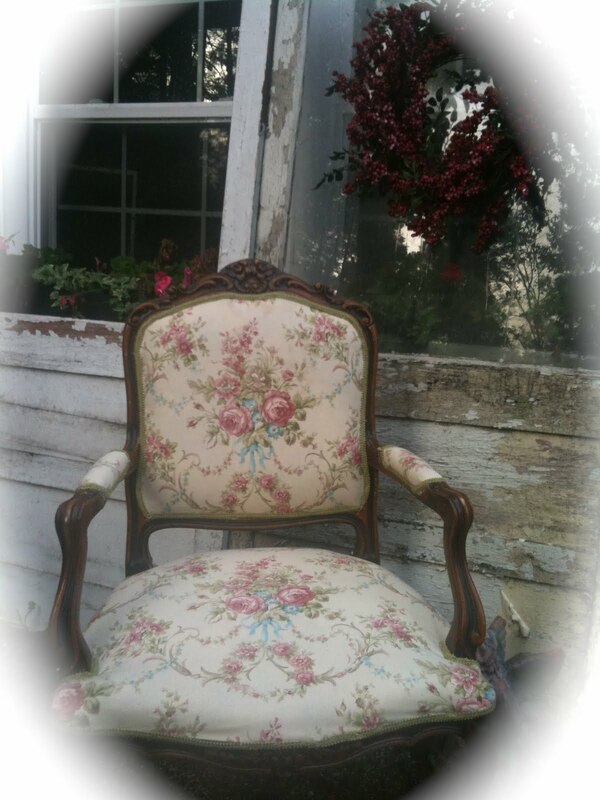 I think the fabric fits the chair perfectly! I have had the fear of cutting fabric before. Always afraid I would mess something up or not have enough. Some times you just have to dive in and know that you can always find another favorite fabric down the road. 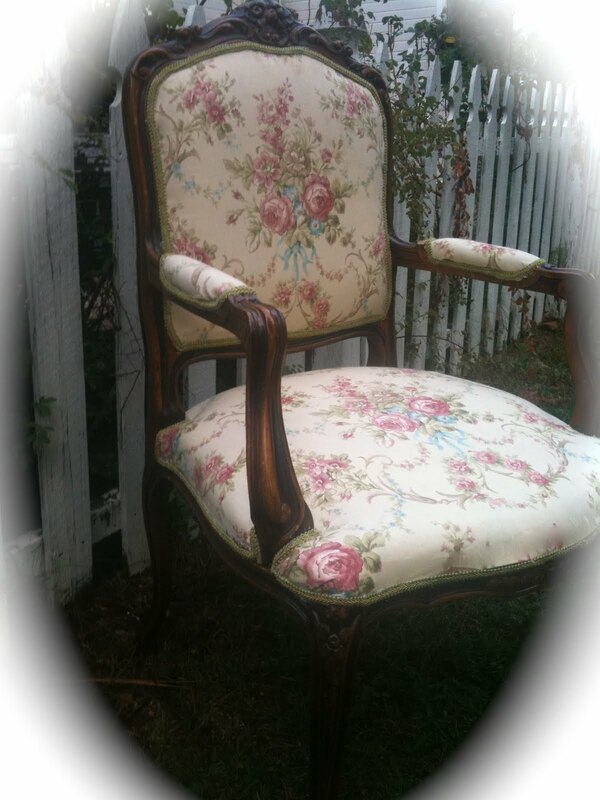 Hi Courtney ... the chair is FABULOUS in its new floral fabric! LOVE it! You did an amazing job ~ how did you learn to upholster???? Such a talented girl ~ more than just a pretty face! 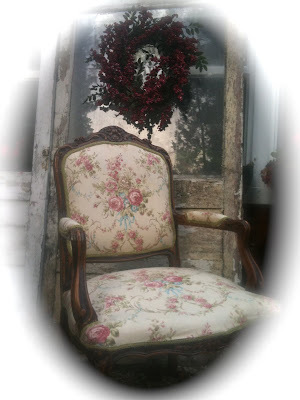 I love, love, LOVE, your french inspired chair! 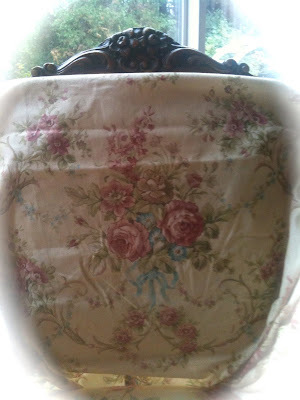 The fabric is perfect and what a lovely job you did! I'm happy for you. Have a beautiful day. Courtney the chair is elegant and very pretty. I just adore the feminine fabric and dark wood. Great job! LOVE IT! LOVE IT! LOVE IT! Courtney, that was absolutely the most perfect choice and how great that you got to use fabric you knew you already loved. I totally know how you feel about finally cutting into something. It just feels so permanent! But this is exactly what I pictured you doing with the chair and it looks fabulous! You gotta show us where it is now sitting in your home! Wow! You did a fantastic job. Do we get an upholstery tutorial? Pleeeeeease? I just wouldn't know where to start! I know JUST what you mean about not wanting to cut into beautiful fabric. I have some like that in our cupboard. It's silly really as if it was out every day I could admire it so much more! WELL DONE for being so brave with yours! 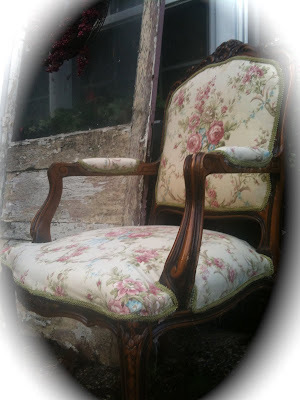 Shabby French love for sure! I love that fabric and I know what you mean about not wanting to cut it! LOL! I've done the same. yaaay for the floral!!! :) that was my vote originally, and I love that you used a very favorite piece to cover it. Now it will truly be a treasure to you! Nice job! 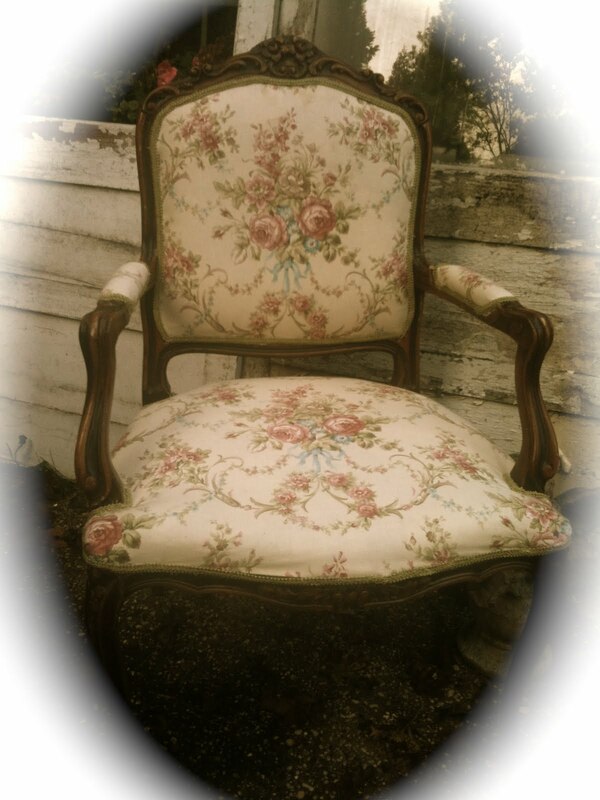 You made the perfect choice for your beautiful chair! It is absolutely lovely. A perfect combination. I make window treatments and do a little reupholstering and I know exactly what you mean about cutting into a fabric. I think everyone who sews and loves fabric, has a stash that is waiting for the perfect project. I know I have mine. So very pretty Courtney!! Looks like a Robyn Pandolph print. I love her prints. You did a great job on the chair! Gorgeous! I like how you left the wood. Did I just say that outloud? 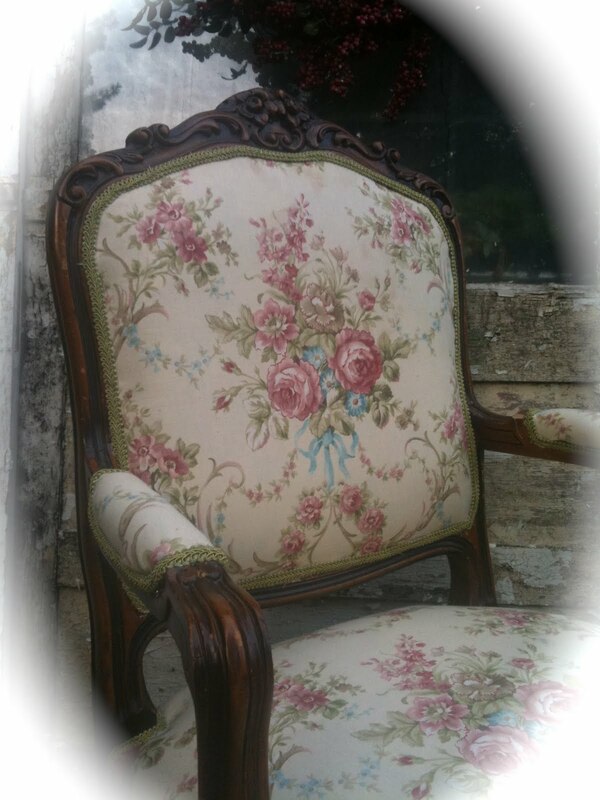 :) I paint everything but the rich wood looks beautiful with the fabric. Good eye! This chair is honestly to die for! Everything about it is perfect! Thanks for your comment on the party! :) The Syrah was our contribution- isn't that funny?! I LOVED it! I'd definitely get it again. I think everyone else really liked it too- how funny on the connection with your dad!! It turned out beautifully! 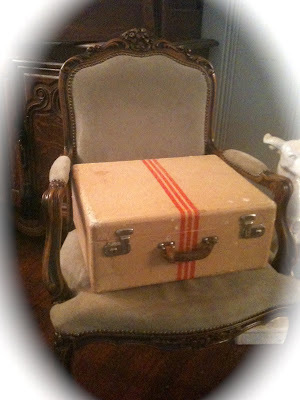 I would love to find a chair like that for $20!! Ooh la la bien sur Courtney! C'est parfait frenchy chair! You were the one who reupholstered it??? Omigosh, you did a perfect job! 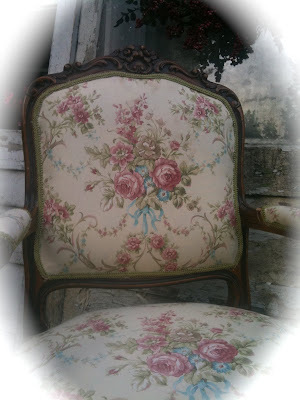 It really is a perfect french Louis chair! J'adore it mon ami! Aren't you glad you saved the fabric for this perfect chair? This is so beautiful and the fabric is perfect for it. Love it! I LOVE that chair! 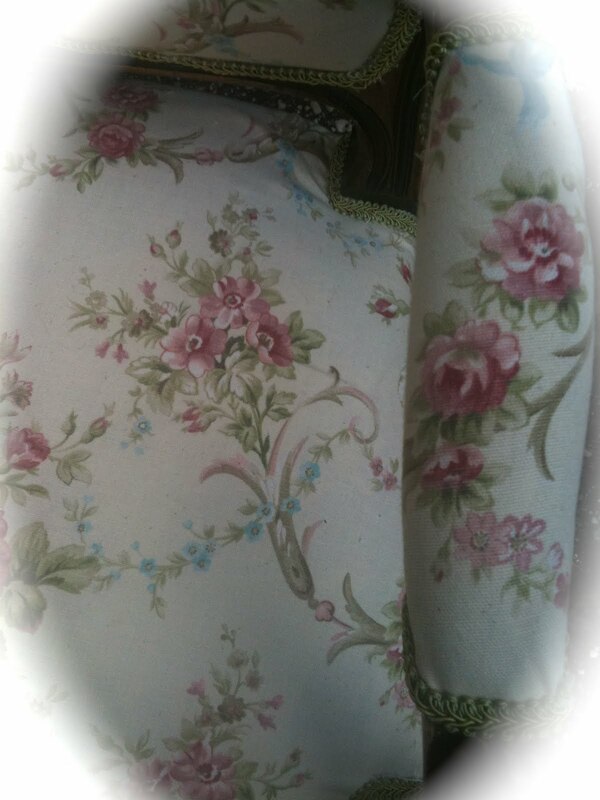 The dark wood contrasted with the pretty fabric is gorgeous. You did a great job recovering it. Thanks for linking it up! Wow! 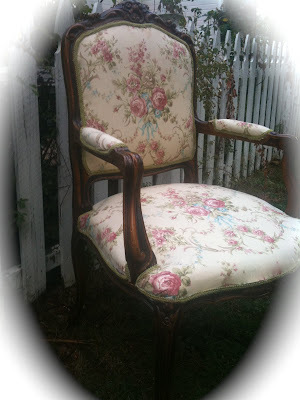 What a beautiful transformation - the chair and fabric are beautifully matched-so inspiring! Absolutely gorgeous!! You did a wonderful job! Take a *peek* at my giveaways if you stop by. Everything is handmade and gorgeous! !